The higher ed classroom is based on paper. Students use notebooks to jot down class notes; instructors distribute syllabi and supplemental content throughout the term; mid-term and final exams are taken using paper and pencil; and students fill out the (usually) dreaded end-of-term course evaluations. But let’s face it: paper is for the most part a real pain to deal with. Paper is always getting lost, and the more important the document the more easily it’s misplaced. Paper is bulky to carry, causing backaches and loss of height if carried in sufficient quantities and over long enough periods of time (I know this is true because I read this on the Internet). And what about paper cuts? OUCH! So is a paperless classroom possible? Sure it is, and it’s easier to implement than you may think. Let’s take a look at what is needed to get started. First, you need a place to house your documents that is accessible by your students. The easiest place is on the course management system. Have RHCHP Learning Technologies (rhadmin@regis.edu) create a course shell and make that your repository for your paper-based documents such as syllabi, assignments, readings, and supplemental materials. Next, you’ll need to convert any documents currently used in your course to an electronic format. Word docs should be saved to a unversally acceptable format such as .pdf, .rtf, or .html. This avoids compatibility issues with students not using Microsoft Word. Handwritten notes should be scanned and saved as .pdfs. Don’t have a scanner? Then walk across campus to the CAT Lab in the basement of Carroll Hall. CAT Lab associates can get you started in this very easy process. All other paper-based documents such as pictures and graphs can be scanned as well. Just be sure to save these in a universally acceptable format such as .jpg, .gif, .pdf, and so forth. And while you're at it, convert your other paper-based materials to an electronic format such as gradebooks (use your course LMS) and course schedules (print to .pdf and upload with your other materials). Need a place for collaborating with colleagues on a research project? Then throw away your paper files and log in to Google Docs. Google Docs is a collaborative, cloud-based, application, with all files safely stored online in your personal Google account. You create your document using Google Docs or upload an existing document. Then invite your research group to share in the editing process. Edits are visible immediately to other group members. Look for a later post on this useful and free app. So get started de-papering your classes. Your students will appreciate the convenience of 24/7 access to classroom materials and you’ll be well on your way to a paperless (and papercutless) life. Having a social presence on the web is de rigueur these days. Professionals use them to identify colleagues and track down long-lost associates; students use them to keep up with friends and acquaintances; companies use them to find subject-matter experts for special projects. Those not having a social presence on the web are losing out on a vast number of social and professional opportunities. However, your web presence is how people will see you and should be an accurate reflection of yourself. What you place on the web and where you place it can determine how well accepted you will be and by whom. Placing a curriculum vitae on Facebook may be the wrong venue. Similarly, pictures of you dancing with a lampshade on your head during last years New Years Eve party may not be the professional image you want conveyed on Academia.edu. So how do you get started in creating a worthwhile and sustainable web presence? Identify which sites cater to what you want to convey and then create your free accounts. · Facebook (facebook.com) is typically used for your personal presence. This is used by friends and family to find and keep up with your activities. · LinkedIn (linkedin.com) is used for your professional activities. Here is where you may place links to your vitae, educational interests, and current and past employers. · Twitter (twitter.com) is used for short, real-time updates on your activities. One example is the “tweeting” of 144 character-long updates on conference sessions you may be attending. · Academia.edu (academia.edu) is the current king of the hill for academics. This site provides space for your CV, teaching philosophy, and a ton of other material related to your scholarly pursuits. There are certainly other sites providing space for your activities, both personal and professional. But getting started with one or more of the above will give you a solid foothold with your social web presence. For more information on creating a web presence check out Emory University Library's Creating a Web Presence: A Primer for Academics (Part I) and Creating a Web Presence: A Primer for Academics (Part II). And remember: keep morning-after-party pics to a minimum, please. 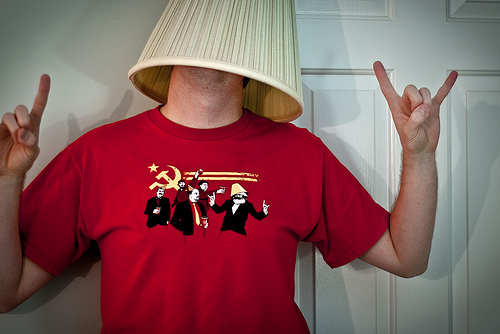 William Brawley, "Communists" February 16, 2011 via Flickr, Creative Commons Attribution. Curatr is free to join and use. There is also an enterprise version that supports more features such as unlimited uploads. There is a teacher free edition available and Curatr must verify you are an instructor. It is a tool you sign in and no software installation is needed. It can be used on Windows, Mac’s, or mobile devices. Mobile devices need to download an app. Ease of use: Curatr is easy to use, but will require planning and time to deliver content most effectively to ensure students have a significant learning experience. 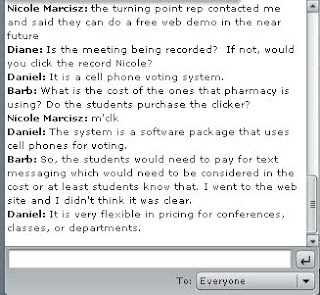 Learning objects can consist of video’s, Word documents, or pdf files. Features: Learning objects can be designed in different levels to deliver the content sequentially to students. At the end of a level a quiz can be given and it can set up so that students must pass the quiz with a certain score to advance. Availability of tutorials/help/support: There are video tutorials available as you progress to each step providing clear instructions. There is an email address and phone number available to contact the company with any questions. Visit the site at http://curatr.co.uk/ and watch the promo video to learn more about Curatr. Jim Henry and Jeff Meadows, “An absolutely riveting online course: Nine principles for excellence in web-based teaching,” Canadian Journal of Learning and Technology 34, no. 1 (2008), http://www.cjlt.ca/index.php/cjlt/article/view/179/177. I came across this article the other day and although it is from 2008, I found that it is still a good reminder of the basics of what makes a great experience for students. Principle 2: In the online world content is a verb. Principle 3: Technology is a vehicle, not a destination. Principle 4: Great online courses are defined by teaching, not technology. Principle 5: Sense of community and social presence are essential to online excellence. Principle 6: Excellence requires multiple areas of expertise. Principle 7: A great web interface will not save a poor course; but a poor web interface will destroy a potentially great course. Principle 8: Excellence comes from ongoing assessment and refinement. Principle 9: Sometimes the little extras go a long way. Follow the link to read the full article and discover more details for each principle. The 2011 Horizon Report is here! Horizon Project, a comprehensive research venture established in 2002 that identifies and describes emerging technologies likely to have a large impact over the coming five years on a variety of sectors around the globe. This volume, the 2011 Horizon Report, examines emerging technologies for their potential impact on and use in teaching, learning, and creative inquiry. It is the eighth in the annual series of reports focused on emerging technology in the higher education environment." The Horizon Report is aways chock full of great information and provides several links to resources for more in depth exploration of the topics. 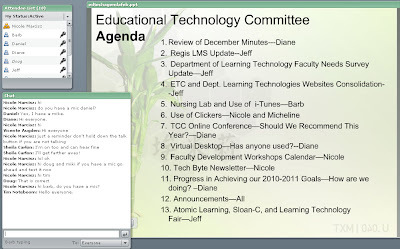 On Tuesday, February 8, 2011 the Educational Technologies Committee, a committee of faculty representatives from RHCHP and the Learning Technologies Department held its monthly meeting. The meeting should have taken place the week before, but was postponed due to the threat of inclement weather. As you may recall Tues., Feb. 8 was also pretty nasty with blowing snow and temps barely rising above single digits. With advanced warning of impending weather certain to create the typical poor driving experience in Denver under such circumstances, the committee decided to hold the meeting in virtual space to ensure that everyone could attend. We used Adobe Connect. This image shows our actual meeting space. Within this meeting, we were able to accomplish everything on our agenda just as quickly as if we were together, maybe even quicker as discussions were concise and less apt to stray off topic. Much of the credit for this success was due to the organization efforts put forth by Nicole Marcisz who set up the meeting room and managed it while Diane Ernst, the committee chair, stayed right on top of attendee participation keeping the meeting moving on task. 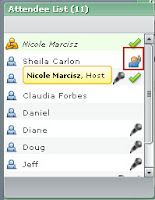 Communicating in an online can occur several different ways. We all had microphones that enabled us to use audio similarly to a conference call, but with ten people in the room ten live mics it could have been havoc. 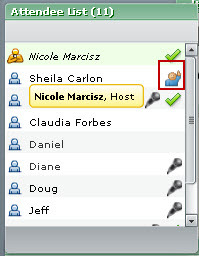 Nicole and Diane established a useful protocol in which we used the “hands up” symbol, easily toggled on and off, to indicate that we had a question. We would then be granted permission to turn our microphones on and state our question or discussion point. The microphone connection for several attendees was problematic. Rather then spending a lot of time trying to correct it they opted to use the Chat pod to post their questions and comments. Again, Nicole and Diane were right on top of the posts and this attendee was completely involved with the conversation. One of our tasks required that we discuss and vote on an agenda issue. 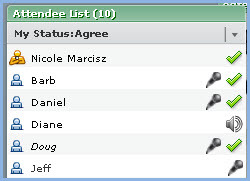 We used another function of the Attendee List, which allowed us to vote up a topic, by using a green check mark. A vote against would have been indicated with a red mark. During the meeting one of the presenters needed to demonstrate a website. this was easily brought into a share pod so that attendees could see exactly what the presenter was talking about. 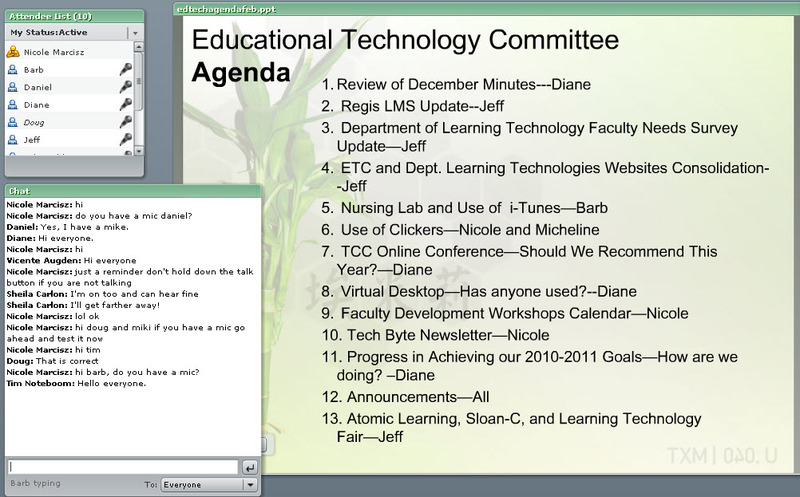 By employing technology readily available, our committee meeting went off without a hitch. The use of this technology is accessible by all Regis employees and staff. Currently it used by online and ground-based instructors for students presentations and guest lecturers, committees like ours who anticipate members not being able to be physically present, meetings which require presentations from distant experts who lack the time or budget to travel to campus, meetings which need to be recorded for later review, and... Well you get the idea. Many options. "Second Life is a 3D virtual world created by its Residents (people like you) that’s bursting with entertainment, experiences, and opportunity. The Second Life Grid provides the platform where the Second Life world resides and offers the tools for business, nonprofits, educators, and entrepreneurs to develop a virtual presence." Second Life is free to join. There is a cost if you want a virtual environment created. It is a program that you download and install on your computer. It can be used on Windows or Mac. Ease of use: Second Life is easy to download and install on your computer, but will require ITS to install on your computer. There are a lot of button combinations to perform different interactions; it does take some time to get comfortable with Second Life. There is a help section and knowledgebase located inside the program. The help section includes guides, a search feature, and highlights basic functions. During the initial game play there are built in tutorials to teach basic game play. The knowledge base includes a search feature, hundreds of articles and video tutorials. An article on USA Today describes experiences of some Universities utilizing Second Life. 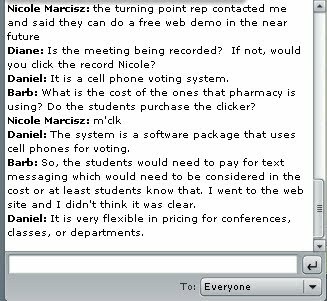 Professors at Drexel University and University of Texas use it as an optional study tool, but would not want to use it to teach in. They prefer the real life classroom for lectures or slideshows. Others teach online courses with Second Life. Second Life allows the flexibility for anything to be created. A lot of universities use it for educational purposes and people use it for fun which makes the program very large. At times simple navigation such as walking can be difficult. The article can be found at http://www.usatoday.com/news/education/2007-08-01-second-life_N.htm.